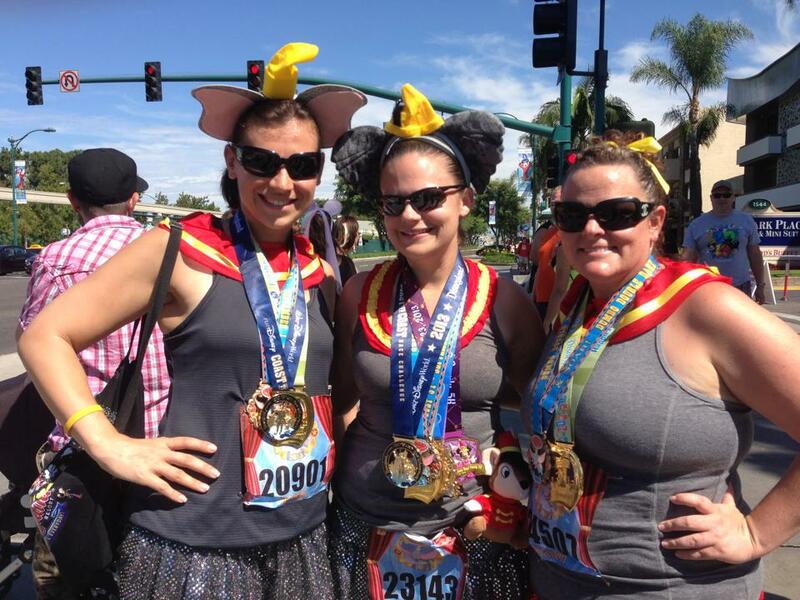 Just over a month until the 2014 Disneyland Half Marathon weekend! This time last year, I was still running my own personal blog, which I had originally created to keep me on track while training for my first Goofy Challenge. I thought that would be the end of my running, but HA...not so! So...in an attempt to psych everyone up even more, I thought I'd share my reviews (there are a few parts) from previous Disneyland Halves as part of a little "Throwback Thursday" mini-series! (If you missed part 1, The Expo, check it out HERE The 10k is HERE) Enjoy! And here it is: the final day of the Dumbo Double Dare! 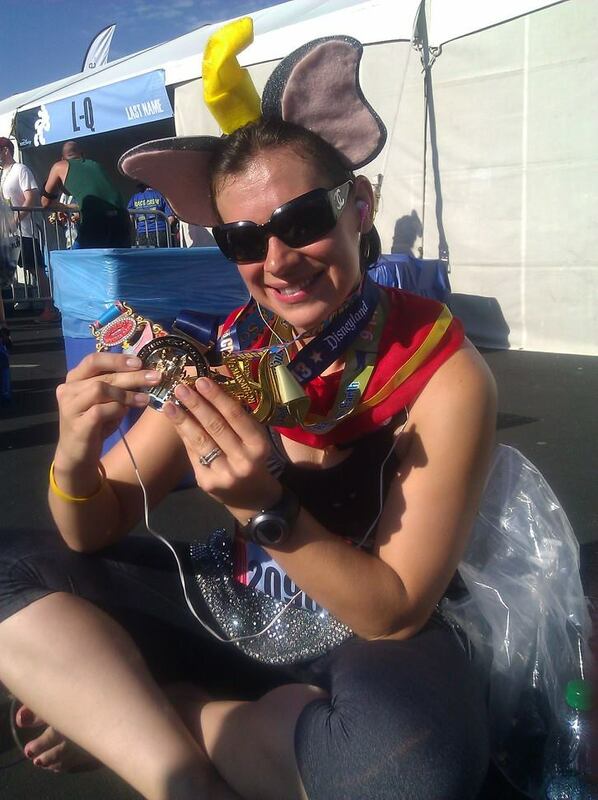 This marked my (and my hubby's) fourth Disneyland Half Marathon. We have never run one together, so this was a first! Side note: we actually thought about running together in 2011. We started out and made it about 100 yards before I ditched him. I'm a bad wife. We all got up bright and early, had some breakfast, and were off to the corrals. This time, we had matching costumes (Me and Katie were Dumbos, Chris and Bill were our magic feathers). When we walked outside, it felt much cooler than the previous morning. Not cool, but at least a bit cooler. We were running a little late, and Chris and Katie were worried about being swept (Katie was coming off surgery this summer), so they headed off to get toward the front of their corral. Bill and I headed to bag check and (of course!) the potty stop. What can I say...I'm a creature of habit! We never got a picture of the 4 of us--damn! I was really bad about pictures on this trip! We are pretty "seasoned" on this course, so we negotiated a plan: we would run to the first water station to get through some of the crowd, then move on to a 3:1 run/walk. My hubby was trying to get me to not pay attention to the time...it's a hard thing to just throw away. 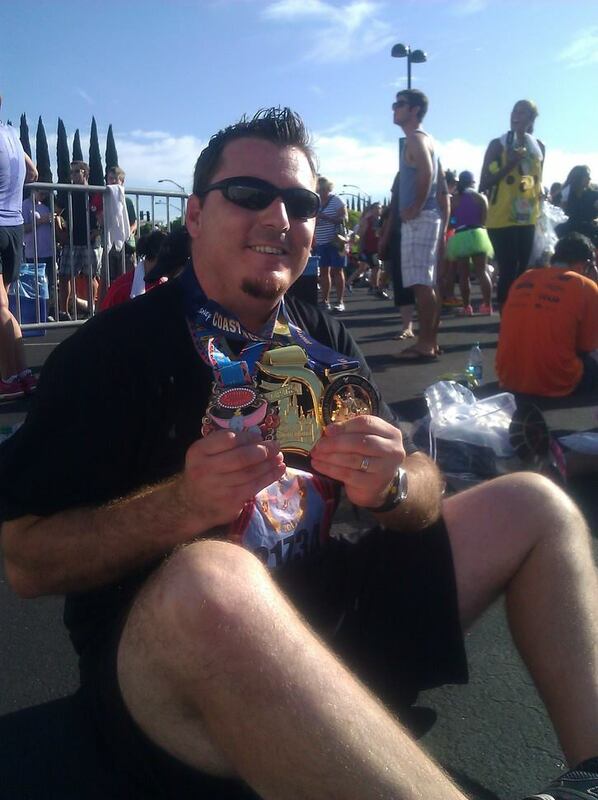 In my mind, though, I knew it was hot, I had just PR-ed my half time 4 weeks earlier, and we were just running "for fun". Disneyland never disappoints with all of the rides running, characters, and music. I actually turned off my ipod for most of the race. I have to admit, while running together always slows us down, we do have a lot of fun! I wish I had brought a camera along, even if just for a few shots. Next time. If you're not familiar with the course, it's pretty simple: DCA, Disneyland, streets filled with people & cars, Honda Center, Anaheim Stadium, Finish Line. We added in one port-o-potty stop. It was a pretty quick race. We did, though, have a pretty eventful finish. We finished about 5 seconds after Joey Fatone. Pretty cool, right? Yes, in that I can attest to the fact that he did actually run the race (in case anyone had doubts). Yes, in that my 16 year old self still freaked out a little seeing him in person. No, in race world where you just want to collect your medals and get one of the cooler towel things. I did have to ask someone for a medal and we had to backtrack because somehow we missed the towels, and they missed us. Small price to pay. They said they felt terrible...but they sure look happy here! 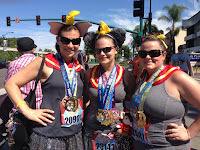 We collected our THREE medals...half, Dumbo, and coast to coast. We knew Chris and Katie were going to be a bit longer, as they started about 45 minutes after us. We sat around, had our snacks, and tried to use what brain power we had left to calculate their finish time. Luckily, we knew a little bit of navigating the finish line area and found a prime spot right under the 13 mile marker. It was hotter than hot at this point, and we started to worry about how they were feeling. Soon enough, though, they rounded that corner looking strong! Glad we were able to cheer them on. They did the whole medal/snack/meet at the tent thing. We met up with them, and it was far beyond hot at this point. We didn't even bother to take pictures, just wanted to head back and find a shower! Katie and I both looked like we peed in our pants (cute, I know) and poor Bill and Chris were baking in all black. We all made it! We did it! 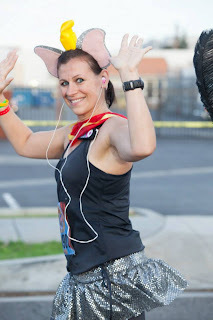 Dumbo Double Dare--check! It was super fun to have a group to be with.